Hadassah France held an elegant Gala Evening on March 29, 2017 in the sumptuous setting of the Salle Gaveau. The many dignitaries among the full capacity crowd included the Chief Rabbi of Paris, mayors, politicians, community leaders, and actors, including Michel Leeb, the “Godfather of Hadassah France”. 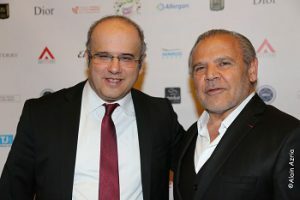 This charity evening, dedicated to the Rehabilitation Center at the Hadassah Medical Center in Jerusalem and to Franco-Israeli scientific and medical cooperation, began with presentations by Professor Emmanuel Messas, President of Hadassah France, and Dr. Sydney Ohana, Honorary President of the organization. They both emphasized the numerous scientific advances made by the medical teams in the Hadassah Hospitals and the attentive care given to each patient, irrespective of ethnicity, origin or belief, which resulted in Hadassah’s nomination for the Nobel Peace Prize in 2005. The Guest of Honor, Professor Claude Cohen-Tannoudji, recipient of the Nobel Prize in Physics in 1997, was awarded a certificate by Hadassah France for his unfailing commitment to Research and Peace . An emotional highlight was the video testimony and then the appearance on stage of the Israeli soldier Haim Levtov, who had been very badly wounded while protecting the border in Gaza in 2014. Levtov recovered the use of his arms and legs with intensive, first-rate care at the Hadassah Mount Scopus Rehabilitation Center. As the audience rose, Haim Levtov sang the Israeli national anthem. 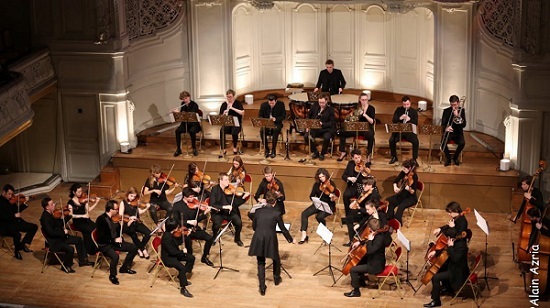 The concert, presented by the sprightly Stéphane Bern, was of exceptional quality. The appreciative audience rose to applaud the performers on several occasions. The artists who entertained the audience included the New Europe Chamber Orchestra conducted by Nicolas Krauze; the moving Tenor Paul Gaugler; harpsichordist Camille Ravot; two young sisters, the violinists and cellists Camille and Julie Berthollet; and the clarinetist Pierre Genisson, who concluded this memorable concert with a brilliant performance of “An American in Paris” by George Gershwin, and klezmer melodies. Hadassah France would like to thank all the sponsors who contributed to this event and made it possible. In addition, they warmly thank their faithful donors for their support of this concert to celebrate music, advance research, maintain peace and nurture hope.